did anyone bought jadoo tv 4 reviews, how is it, what channels does it have? does it pay to buy it for desi channels? Update: As most of you know, As of March 19,2011 mostly all content providers issued a lawsuit against Jadoo tv & almost all the channels have been removed. please DO NOT BUY JADOO TV OR JALVA TV or any other IPTV box, they all are ILLEGAL. In order to help community if you know any working channels for jadoo tv then please share them under Working Jadoo Tv Channels section. Please check back for latest updates. Jadoo Tv is back with Jadoo tv 3 & Jadoo Tv 4, however we cant promise about the list of channels they have. Let me start by saying, jadoo tv is a useless device. you will not see any Pay Per View's or premium channels by buying this device. you can watch few Indian channels on it (not all of them), with poor quality and they go up and down constantly with allot of buffering. This product is totally overpriced. if it was around $20 then it’s worth buying (maybe). if you just want to watch few channels online, then you don’t need this device, you can watch Indian channels live on many websites c. or just Google it, you will see 100z of sites. You can also visit on demand section on this website to watch dramas. QFX Abx-10 Android TV Box. This works great for KODI. Basically it uses your internet connection, so you must have a Fast Internet ISP. then it connects itself to its server(which streams channels) and streams them for you, which is same as if you were watching these channels on your computer. You can buy yourself a PS3 and have Ps3 stream internet for you (at least you getting a blu-ray player and gaming console for this price). You are also running into a risk where a device connects itself to internet, and your computers IP address could be saved and reported back to legal authorities. My advice is to stay away from this device, its overpriced, it's not 100% legal, it lags alot and offers only few useless channels. I can’t really provide a list of 100% valid channels, since every other day they are been taking down (upon legal notice). Sooner or later all channels will disappear from their server. UPDATE: MOST SOUTH ASIAN CHANNELS ARE DOWN ON JADOO TV. THEY ARE BEEN SUED., they are trying to find more illegal ways to stream channels on their device... which i am sure will last for another couple of weeks. please save your money. 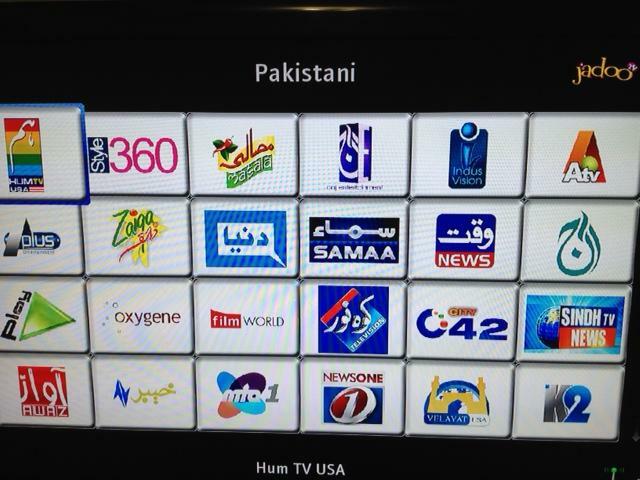 UPDATE: Jadoo Tv officially signed a contract with HUM TV USA. Currently only few news channels are working on jadoo 1 and jadoo 2 (Update as of September 2012). Also Follow Jadoo Tv list of Working Channels Blog for updates. here is an image of channels screen on jadoo tv. Live HUM TV Channel Blog. I need to buy Jalva Tv within USA, anyone selling? I can pick it up if in NY, otherwise I can pay for shipping, new or old does not matter. Please give me your best offer. So now Jadoo Tv launched Jadoo3? I mean are you kidding me...really. enough is enough, somebody needs to put an end on this non sense worthless box, they only have 1 or 2 GOOD Live channels which are available in all versions of Jadoo Tv (1 & 2). They need to know Jadoo Tv is not APPLE iPhone, its a garbage box, so releasing new versions means NOTHING. They just want your money with same features and channels crap.